The joint was jumpin’ with two excellent shows Saturday evening and Sunday afternoon. Ray Vega has assembled a first-rate ensemble with some of Vermont’s finest jazz musicians: Brian McCarthy on alto saxophone, Mike Hartigan on piano, Giovanni Rovetto on bass, Caleb Bronz on drums, Scott Dean on congas and percussion, and Vega himself on trumpet, flugelhorn, and percussion. The program was combination of standards and originals by Vega and members of the band. Vega is a master of engaging banter, too. 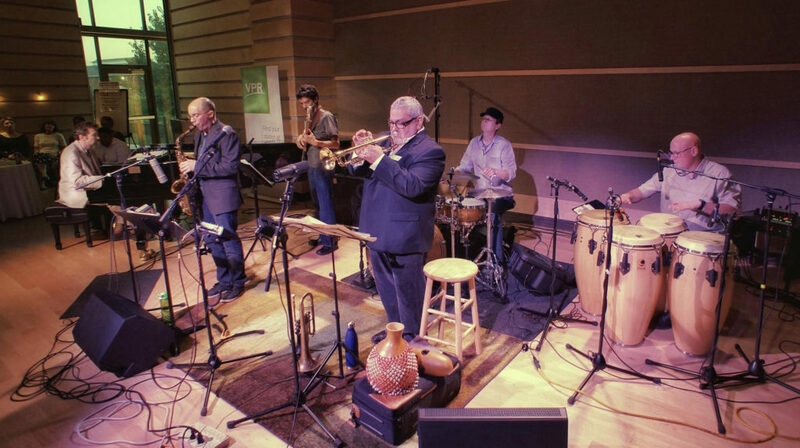 One standout moment, particularly poignant, was his remembrance of trombonist Rick Davies, a beloved friend, colleague, and member of the greater jazz community who passed two years ago, followed by a performance of one of Rick’s tunes. Snowy roads kept a lot of folks from venturing out to Saranac, but the intrepid faithful who showed up were wildly enthusiastic and vocal. And yes, there was dancing in the aisles! And a salute to the hearty North Country community for their pure grit! 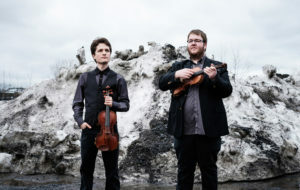 Snow and ice did not deter a good-sized enthusiastic crowd from coming out for two fabulous concerts by the French-Canadian traditional music duo of Alexis Chartrand and Nicolas Babineau. The musicians put a distinctly contemporary spin on the old tunes – an extravagant array of reels – they collected from Francophone communities in the far reaches of eastern Quebec and the maritime provinces of Canada. Both are virtuoso fiddlers, having started very young with rigorous classical training. Nicolas on guitar was alternately ethereally poetic and fiercely rhythmic, while Alexis tapped out complex driving rhythmic patterns with his feet from pianissimo to fortiss-iss-issimo! Just when you thought he must be exhausted and could do it no longer, Alexis ramped it up even more energetically with hidden reserves of power. Mélissandre Bourassa-Tremblay added a potent visual element with some dynamic step-dancing, heavily influenced by her ballet and modern dance training. Alexis and Nicolas also dared to play some very quiet and slow sustained songs – enticing and captivating the ear with calm and touching interludes – islands of peace in a high-energy kinetic sea. The duo was with us for a week-long residency. During their first days they hunkered down to work on new arrangements of the repertoire they had recently collected. They are keen to record this new material, their first recording having been nominated “Best Traditional Album” at the Canadian Folk Music Awards. They also spent two days working in schools: with French language classes at the Saranac Middle and High Schools and with grade 4 and 5 music classes at the Saranac Elementary School. An intense busy week! This concert was rather unusual in that it was a traditional violin recital featuring standard repertoire. Outmoded? You must be kidding! Think retro. Think vintage. And like vinyl, cool again! 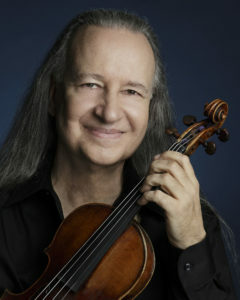 Arturo Delmoni delivered the quintessential virtuoso violin recital, partnered by the superb pianist Li-Pi Hsieh. It was utterly refreshing in that there were no gimmicks, no quotas to fill. It was simply great music played with superlative technique and supreme expression. One of our friends commented that Arturo plays so naturally, it’s as if he was born holding a violin. His program opened with Sonata in E Major by Pugnani and was followed by Beethoven’s beloved Violin Sonata No. 5 in F Major, “Spring.” Then came Grieg’s lesser known Violin Sonata No. 2 in G Major, a stunningly beautiful work that drew the audience to its feet. Following intermission came Hexapoda: Five Studies in Jitteroptera, a delightful suite of five jazzy pieces written by Robert Russell Bennett in 1940 sporting such titles as “Gut-Bucket Gus,” “Jim Jives,” and “___Till Dawn Sunday.” Of course, no proper virtuoso violin concert would be complete without a set favorite short works, and Arturo Delmoni did not disappoint. He chose Hungarian Dance in f minor (Brahms-Kreisler), Song Without Words, “Sweet Remembrance” (Mendelssohn-Heifetz), Legend of the Canyon (Cadman), Claire de Lune (Debussy), Mazurka, “Dudiarz” (Wieniawski), and Valse-Scherzo, Op. 34 (Tchaikovsky). Naturally, an encore was demanded, and Arturo offered Prighiera of Heifetz, so touchingly played, we were nearly reduced to tears. 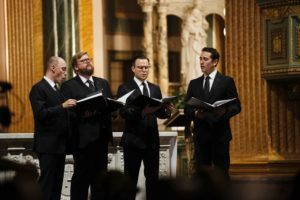 New York Polyphony’s concert “Faith and Reason” was all that we hoped for, and more! Presenting them in Redford’s Church of the Assumption was spot-on. The precious old stone church has cathedral-like resonance, and the voices rang out and floated in the air. The vocal blend was miraculous, while each of the four singularly beautiful voices remained distinctive and strong throughout. It is clear why New York Polyphony enjoys a reputation as one of the finest vocal chamber ensembles in the world. We were delighted to welcome Emerald Trio back for their second residency (the first having been in 2015, when they recorded Big Green Apple, their debut disc of all-new works composed especially for them, released last year to glowing reviews). This residency was all about breaking in a new pianist and work-shopping a new piece commissioned by Hill and Hollow Music for Emerald Trio. Composer-pianist James Sheppard wrote (pretty much on-site at Harvey House) a collection of five Adirondack-inspired miniatures that captured many moods and conjured many colorful images: “Adirondack Run,” “Saranac Shimmers,” “Alone Mountain,” “Farmers’ Duet,” and “Night Time Whiskey.” The premiere performance was enthusiastically received – the audience loved it! We know that it will be programmed a lot on future Emerald Trio concerts. Other works performed also deserve a mention. True to their mission, the Emeralds champion under-exposed worthy composers from the past. They played a beautiful suite by Mel (née Mélanie) Bonis (1858-1937), a little known contemporary of Ravel. A protégée of César Franck, Bonis published over 300 works as “Mel” Bonis because women composers were not taken seriously in that period. The Trio also played works by T.O. Sterrett (b. 1953), Howard Cass (b. 1989), and Alessandro Annunziata (b. 1968), demonstrating their commitment to contemporary chamber music and building the repertoire for their ensemble’s instrumentation of flute, violin/viola, and piano. It was a well-designed program, beautifully played, and thoroughly enjoyed! We were privileged to be host for an off-campus concert by advanced students of the renowned Meadowmount School of Music. The program began with Weilu Zhang playing two movements of the Sonata for Solo Violin in A minor, BWV 1003 by J.S. Bach. Then followed the exquisite Ravel Trio in A Minor with Liam Kaplan, piano; Nanao Yamada, violin; and Jeremy Tai, cello. After intermission Jeremy Tai performed a movement Kodaly’s wildly virtuosic Sonata for Solo Cello, Op. 8. The concert’s glorious culmination was Schumann’s Quartet for Piano and Strings, Op. 47, with Matthew Harikian, piano; Weilu Zhang; violin; Aaron Rosengaus, viola; and Luiz Venturelli, cello. 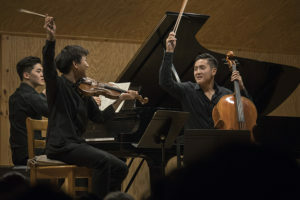 Founded in the Adirondacks in 1944 by the legendary Russian violinist and pedagogue Ivan Galamian, the school soon became – and continues to be today – a pre-eminent summer program for young musicians training for a professional career in music. Meadowmount offers a bucolic environment with a balance between the enjoyment of nature and the pursuit of high art. Individual instruction in the solo repertoire, participation in weekly master classes, guest artist master classes, and involvement in a chamber group coached by both the piano and string faculties provide for a tremendous amount of growth. Alumni of Meadowmount have won every major competition worldwide, and are among the very best of international soloists and chamber musicians, concertmasters and principal players of the world’s leading orchestras, and the distinguished artist-teachers in every major university and conservatory. Among hundreds of distinguished artists who attended Meadowmount in their youth are Joshua Bell, Lynn Harrell, Soovin Kim, Jaime Laredo, Yo-Yo Ma, Itzhak Perlman, Arnold Steinhardt, Pinchas Zuckerman. 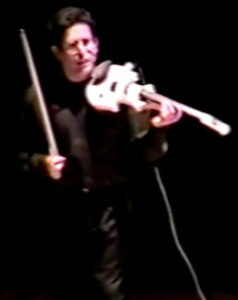 Classical violinist Jonathan Aceto brought out his ZETA electric violin for a great turnout at Weatherwatch Farm. He played two fascinating contemporary works for MIDI violin, background tape, and visuals: the hair-raising SAMPLER: Everything Goes When the Whistle Blows by Salvatore Martirano, inspired by the 1985 terrorist hijacking of the Achille Lauro cruise ship; and the otherworldly Desert Voices by Priscilla McLean, with a slideshow of photos of the Sonoran Desert, where many of the sounds on the background tape were recorded. In between, an aural “palate cleanser,” Jonathan played the “Sarabande” from J.S. Bach’s unaccompanied Suite No. 3 in C with Grand Canyon reverb. 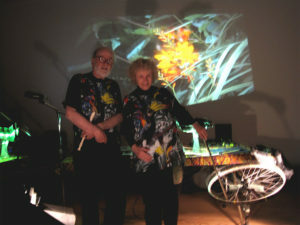 But to get everyone primed for the concert beforehand, the McLeans had created an interactive installation that utilized world music, sounds of nature, intriguing experimental techniques, and projected images. Small groups of 3 to 5 entered into a darkened room to experience, create, and manipulate music and sounds. Later, to round out the evening was a screening of Rainforest Images II, the evocative music-video by Barton and Priscilla McLean based on their adventures in Borneo, Malaysia, and Costa Rica. All the while there was plentiful eating and drinking – all good fun, punctuated with many beautiful, uplifting moments. 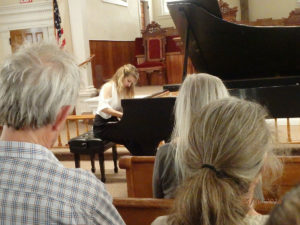 The extraordinary French pianist Lise de la Salle offered “Bach Unlimited,” her current signature solo recital program, conceived as a profound and shining tribute to the timeless genius of J.S. Bach. The concert begins with Bach’s Italian Concerto and moves through three centuries of great composers deeply inspired by Bach. Anchors are Liszt’s Fantasy & Fugue on the Theme B-A-C-H and the Bach/Busoni Chaconne, interspersed with pithy shorter works: Roussel’s Prélude et Fugue, Poulenc’s Valse-improvisation sur le nom de B-A-C-H, Kempff’s arrangement of Bach’s Sicilienne in G Minor, and Liszt’s arrangement of Bach’s Prélude and Fugue in A Minor. 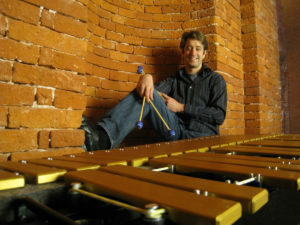 Lise’s friend, composer Thomas Enhco contributed three brief works inspired by Bach’s Goldberg Variations. The outstanding performance demonstrated not only Lise’s powerful virtuosity, but also her extreme delicacy and touching devotion to this music. She is capable of creating a tsunami of sound, yet courageous enough also to dare a barely heard pianississimo. Not a single passage or note is trivial — every scale, roulade, and arpeggio meaningful. Multiple lines and fast passage work are heard with astonishing clarity, while arching melodies unfold with sublime spaciousness. Lise de la Salle has it all, and the audience recognized it! From his now-home in Germany, vibes virtuoso Tim Collins coordinated the latest incarnation of his USA Jazz Group, with Robinson Morse on double bass and Gabe Jarrett on drums – both of Vermont – forming a rock-solid earthy and warm rhythm team. 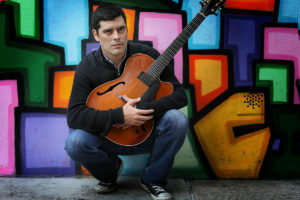 As featured special artist on guitar and vocals (really smooth delivery on both) Davy Mooney blew in from the South, where he currently divides his time between New Orleans and Texas. 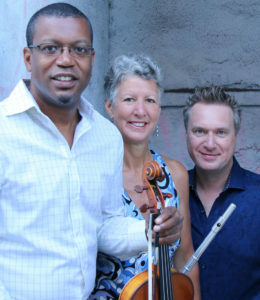 The quartet converged in Saranac for a run of three shows at the Fire Hall, which was transformed into a funky little jazz club such as might be found in Alphabet City in the East Village. The guys did a mellow mix of standards and originals by Tim Collins and Davy Mooney, with periodic bursts of energy and fireworks – overall a perfect balance of cool and hot. Goldilocks would say “just right.” All shows were well attended; standing room only at both Saturday and Sunday shows. Rhythm Future Quartet Delights and Wows! We are so happy the word got around and weather cooperated. The hall was full with well over 150, and many new faces in the audience, too. How lucky we are to experience a live show by Rhythm Future Quartet at the zenith of their fame and popularity, which is sure to escalate even higher. 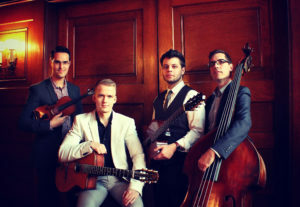 They played a couple of Django Reinhardt classics and some standards by Cole Porter and Oscar Pettiford, interspersed with originals from their recording Travels and their soon-to-be-released recording Rhythm Future Quartet and Friends. Each player contributed at least one original composition, underscoring an amazing level of talent and creativity in the ensemble. The audience roared with appreciation after every song and finally demanded an encore, which turned out to be a very cool cover of “Come Together” by the Beatles. Fabulous show! Posted in Uncategorized	| Comments Off on Rhythm Future Quartet Delights and Wows!